182 pages | 3 B/W Illus. The unprecedented economic success of South Korea since the 1990s has led in turn to a large increase in the number of immigrants and foreign workers in Korean industries. This book describes and explains the experiences of discrimination and racism that foreigners and ‘new’ Koreans have faced in a multicultural South Korea. It looks at how society has treated the foreigners and what their experiences have been given that common discourse about race in Korea surrounds issues of Korean heterogeneity and pure blood nationalism. Starting with critiques of Korean scholarship and policy framework on multiculturalism, this book argues for the need to revisit the most fundamental aspect of multiculturalism: the host population’s ability to respect new comers rather than discriminate against them. The author employs a critical realist understanding of racism and attempts to identify long-lasting institutional factors which make Korean society less than welcoming ‘new’ or temporary Koreans. A large number of new reportages are identified and systematically analysed based on the principles of grounded theory method. The findings show that nouveau-riche nationalism and pure-blood nationalism are widely practised when Koreans deal with ‘foreigners’. As a newly industrialised and highly successful nation, Korean society is still in transition and treats foreigners according to economic standard of their countries of origin. As one of the very first books in English about foreigners’ experiences of Korean nationalism, multiculturalism and discrimination, it will be of great interest to students and scholars of Sociology, Ethnic studies, Asian studies, Korean studies, Media studies and Cultural studies. "From immigrant workers to K-pop stars, Gil-Soo Han explores contemporary South Korean nationalism and multiculturalism. Theoretically ambitious and empirically rich, Nouveau-riche Nationalism and Multiculturalism in Korea should spark discussion and debate." 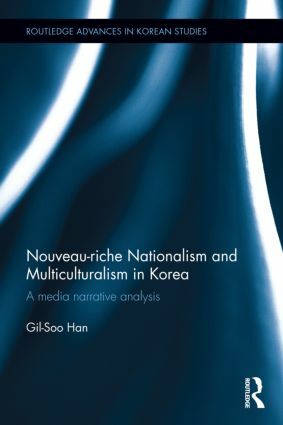 "Gil-soo Han shows, in this richly documented work, that growing ethnic diversification in Korea in recent decades has stimulated an accompanying growth in discrimination against those with a perceived deficiency of "pure Korean blood" or with roots in societies perceived as less prosperous than Korea. This work is a warning that these new fault lines separating mainstream Koreans from migrant workers, permanent residents of non-Korean ethnicity, and even refugees from North Korea, if not addressed soon, may cause social unrest in the near future." "…this book will be helpful not only for Korean studies students but also racism studies scholars who want to enlarge their study horizons…This book’s groundbreaking analysis of everyday racism in South Korea inspires readers to ask new questions, such as whether South Koreans will be able to foster a healthy multicultural society or turn towards the establishment of an extreme right-wing party, phenomena which can be observed in other developed countries but not yet in South Korea." Gil-Soo Han is an Associate Professor of Communications and Media Studies in the School of Media, Film and Journalism at Monash University, Australia. His research interests include migrant communities in Australia and Asia, ethnic media, religion, and health and medicine.